Still not a problem, if ur worried about degenning too much, dont link it with increased duration. If that still isnt enough you can drop dying sun for life flask for bosses. Seems like these nerfs combined with the leech length nerf is pretty bad. Still everything is going to be fine, 20% dmg isnt a big loss, overleech still more powerful than no overleech, and even those builds always have been fine. If you are bleeding and degenning from blood rage at the same time, I can see how that might get noticeable if you stop attacking, but other than that, I dont see an issue. So we take a 20% hit and lose some leech, not that big of a deal, ill upload new vids showcasing it as soon as the patch goes live, but like I said. I doubt any of those nerfs will make this any less viable in any given fight. Played the noncrit elehit build last league, so this league with crit. 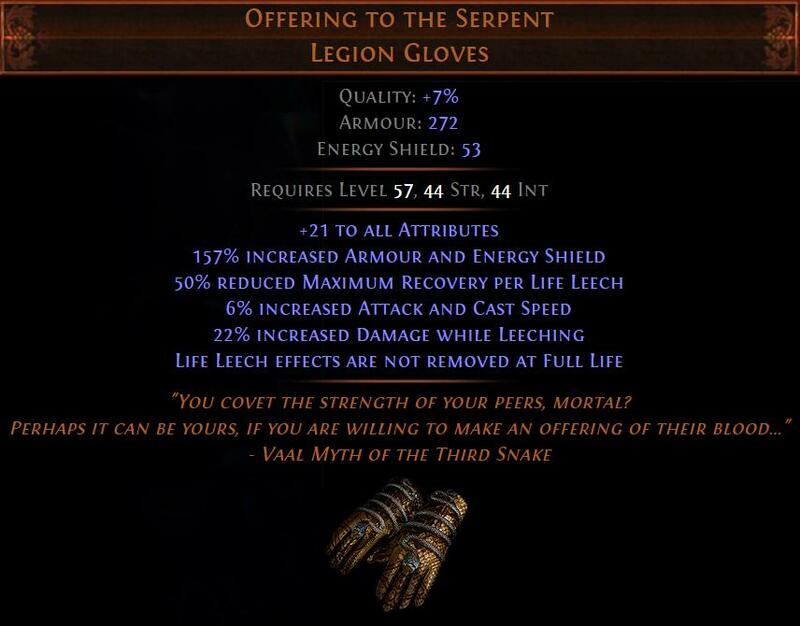 What do you think about this gloves as a replacement for the slayer ascendacy? Yeah I saw them last night, only testing will tell. If the reduced maximum recovery per life leech isnt too cripling, they will be absolutely insane. With those, you can pick any ascendancy you want really, assassin comes to mind with the recent crit buffs. I wont be able to get much testing since I sadly dont have time to commit to this league, but I will play around and add a section with patch related changes and try to add new uniques as options to the build. The new quiver looks sweet, explosive arrow (scales its own dmg with levels) shoud be pretty nice in there, but keep in mind we are able to get a LOT of dmg from a rare quiver. How do u compare this build to a non-crit thi3n version? There is yoke, kaoms and about 9k hp. What do u thnik will be better for maps clearing ang UE/shaper?? In terms of performance, this far outclasses thiens version. It is also way more expensive. Basically, if you are going kaoms they are defensively identical. If you are going with farrul or other chest it depends on the chest what bonusses you get. For uber elder, you can see in the video what a joke the fight is with elemental hit, even with a lower life pool.